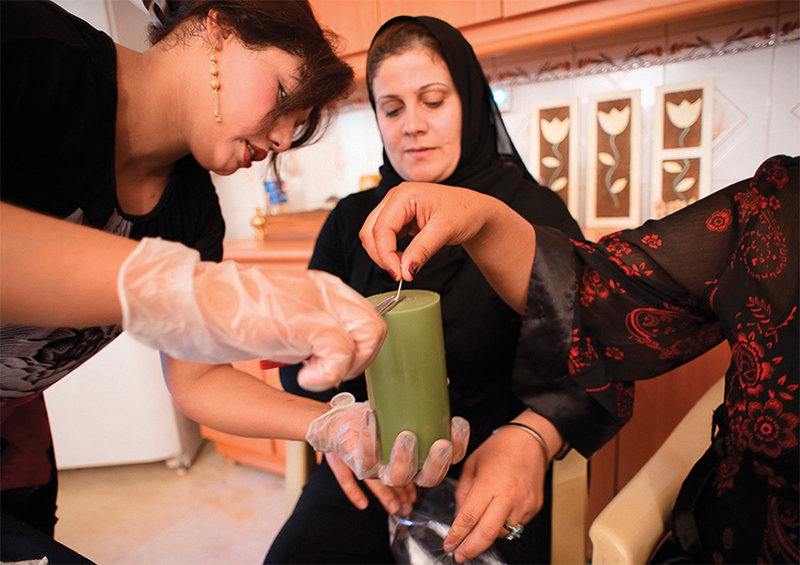 Prosperity Candle, makers of unique, hand-poured candles, is lighting the way for women refugees to escape poverty and to achieve economic independence by providing opportunities for them to earn a living. Patsy’s husband, founder Ted Barber, incorporated the company, a certified B Corp, in Vermont 10 years ago. He had worked for several poverty-alleviation programs and became discouraged that many of the projects funded by aid organizations had little success in actually helping people in developing countries access global markets. What Ted Barber came up with was a candle-in-a-box business. Barber partnered with Women for Women International, an agency that had an opening in its vocational training programs in Iraq. Because the country was in the midst of war, Barber taught women to make candles via YouTube videos he made in his own kitchen. After the 2010 earthquake devastated Haiti, Prosperity Candle launched a group space for candle makers on that island, aiming for higher capacity, lower cost, and more support for the artisans. The candle company now employs approximately a dozen women who hand-pour some 40,000 candles a year in its Easthampton, Massachusetts studio. The candles are sold wholesale, as corporate gifts, under private labels and can be customized for weddings, events, and fundraisers. The Little Market, a fair-trade, nonprofit, online shopping site founded by The Hills star Lauren Conrad and her good friend Hannah Skvarla, uses Prosperity Candle as its exclusive candle supplier. Eco-friendly in addition to being socially conscious, Prosperity’s candles are made from all-natural soy and coconut waxes, have pure cotton and wood wicks, and feature fragrances made from essential oils. Attached to every candle is a picture and a bio of the woman who made it. One of Prosperity Candle’s notable successes is Moo Kho, a refugee from Burma where, as a child, she lived through the horror of seeing her village burn down and people brutally murdered in front of her eyes. She fled with her family to a refugee camp in Thailand where she lived for many years and eventually married and had a child. Moo Kho and her family were able to come to the United States in 2009 but they had little money and no work. She was hired as a Prosperity Candle apprentice candle maker in 2010 and two years later was promoted to production manager, overseeing quality control and training other women refugees. In 2016, Moo Kho became an American citizen, and at age 39 voted for the first time in her life. Now a mother of four girls, the former refugee recently bought her first home, the fulfillment of her American Dream. Prosperity Candle chose to focus on female refugees such as Moo Kho because they found that “women are the ones who make things happen,” Kauffman Barber said, and the company found a niche with candles, both economically and emotionally. For more information, go to prosperitycandle.com.